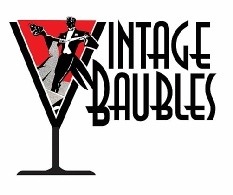 We adore vintage coats and jackets: full-length formal coats, swing coats, car coats, little topper jackets, capes, and more. And we just can’t resist buying them! 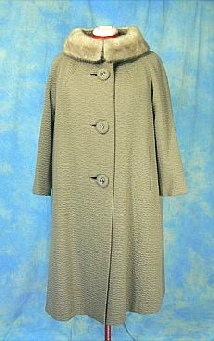 So, we have lots of vintage women’s coats (men’s too; those will be along soon) to bring you. We have far more in stock than what’s listed here, and will be adding them as fast as we can. So, if you’re looking for a particular style and don’t see it, just contact us and we’ll see what we have in our inventory! Gorgeous lush sapphire-blue silk velvet coat, ca. late 30s and in lovely condition! Be sure to check out all the photos! This is an excellent example of a 1930s’ style, with slightly bloused bodice at sides and back, gathered & puffed sleeve caps, and medium-full hem sweep. Stand-up collar fastens with a large mother-of-pearl button (a replacement, but of the same era), and there are two large hooks and eyes at the waist area. The skirt is open below these (so as not to crush your evening gown or dress), and its back is constructed in three panels for fullness. Fully lined in acetate. This coat was from Joslin’s, which was a well-known Denver, CO, department store; the label is embroidered with its former owner’s name. A simple, yet very elegant, coat for any number of special occasions: the opera, or course; to wear over one’s wedding gown for a late fall or early wedding, holiday parties, and more. Size: Estimated a "best fit" for a size extra small to small; shown on our approx. size 2/4 mannequin. Fit can be adjusted slightly smaller or larger by moving the button and hooks & eyes. Please determine fit by the coat's measurements and yours, as well as by what you plan to wear under it. See our sizing tips for more info. Shoulder to shoulder: 12 3/4"
Condition: Overall excellent, sturdy and wearable. The velvet at the buttonhole was split in two places. I’ve mended these areas; while the repairs are visible, with the button fastened, only a bit of one repair is noticeable. With collar worn turned down, they can’t be seen at all (see photos). There is a dark spot next to the button (probably from the original button impressing on the fabric when collar turned back). The velvet has some typical “rubs,” and the back yoke has a few very small spots that look like they’re from raindrops. Gently brushing up the nap, which I’ve done, greatly minimizes these slight imperfections. There is one pencil-eraser-sized hole (in the velvet nap only) near the front edge, where it’s overlapped by the other side–not very noticeable The lining is in fabulous condition, with no color shifting, stains, etc., just one tiny split in it near the hemline. None of these issues detract from the beauty or wearability of this coat, but I’ve factored them into the price. Coat is ready to wear. Eligible for discounted U.S. and international shipping. Please contact us for shipping quote prior to ordering. Shipping: Eligible for discounted U.S. And international shipping. Please contact us for shipping quote prior to ordering. The ever-popular swing coat is done here in soft, plush eyelash-style wool by Forstmann, accented with vertical ribbon detailing on body and sleeves. Circa mid to late 50’s, and perfect for wear over your full party dresses or over a dress, skirt, or slacks for everyday use. 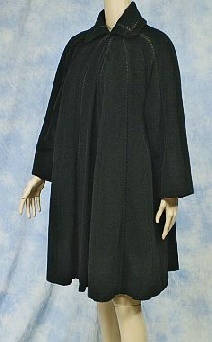 Coat features raglan above-the-wrist sleeves, single-button collar, and rich full-bodied rayon-taffeta lining. Approximately knee length or a bit below; the mannequin is tall, at 5′ 10″, so this is probably a little longer on an average-height woman. Vertical grosgrain-ribbon detailing with ladder faggoting adds flair to this classic swing coat! We have lots of photos; please see. Some have been lightened for detail. Size: Approx. small (4/6) to a medium (8). Remember you’ll be wearing clothing under this, and it’s designed for an ample fit. Check measurements and compare to a coat you already own that fits you well. And see our sizing tips for more info. Exceptionally high-quality coat, ca. mid 60s, made of heavily textured Forstmann wool jacquard. And in a great size, too! Color is a grey-ish beige--takes on different tones with the lighting. Wedding ring collar is of luxe silver mink, can be worn up or down, is easily removable for when coat is cleaned. Has raglan sleeves, slash front pockets, rich taupe rayon satin lining with insulated interlining. Flattering swing shape with 74" hem sweep! Gorgeous buttons; self covered around outside, with shiny embroidery-like yarn interweaving in center. This coat has a simple style that's made elegant and upscale with its wonderful fabric and fabulous construction. Long enough to wear with dressy below-the-knee dresses. Very warm, too! Size: Large to extra large. But go by the coat's measurements and yours, not my estimate. Also depends on what you typically wear underneath. We suggest you measure a similar-style coat that fits you well and compare dimensions. See our sizing tips for more info. Due to its shape, this will measure very wide the further down the body it goes. This custom-tailored cape, ca. late 60s or early 70s, was made by a professional dressmaker. She did alterations for local upscale department stores and had a private clientele that included many area socialites and business women and men. Her work is excellent! The fabric this cape is made from is really fabulous–a dark brown worsted wool woven through with gold metallic threads, resulting in a subtle tweed pattern. Beautifully detailed, cape front is constructed in six panels, with curved seaming at the yoke for a smooth fit. Fastens with two large self-fabric-covered buttons and has open slit openings for one’s arms. Even the lining in this cape is lovely–a lightweight, silky-feeling polished cotton. This probably falls just below the knee, depending on how tall you are (hard to judge on the dress form, so please see the dimensions below). You must view the additional photos to see the fabric and detailing on this terrific piece! Size: Approx. Small to medium, with some flexibility in fit. Shown on a size 6/8 dress form, which it fits well. Condition: Near mint to mint; appears unworn.